For more than 50 years dacron sails have been the standard for racing as well as cruising sails. 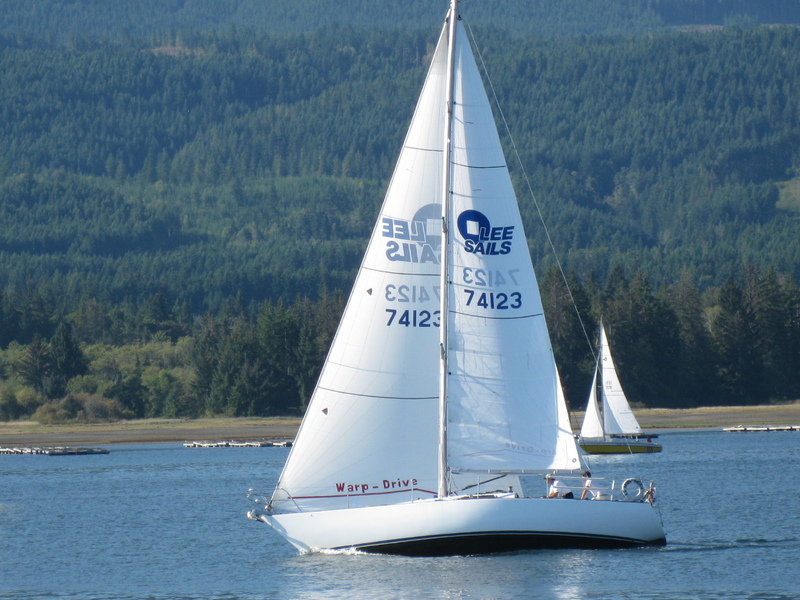 Many one design classes still mandate dacron sails for their longevity, low cost and consistency. Classes such as the venerable Star Class use only dacron sails and continue to attract to world's best sailors. From Lasers to J70s small boat sailors everywhere enjoy the benefits of dacron. And of course the vast majority of club racers use the same dacron sails on week night races as they do for weekend cruises. Grand Prix and America's Cup sailors with unlimited budgets sought out new, lighter weight materials to produce the exotic laminated, load path designs we see today on the race course. Fibers such as Kevlar, Spectra and Carbon combined with Mylar films and woven scrims result in a sail with enormous strength to resist stretch yet are light weight and flexible. Naturally, the club racers and weekend warriors aspire to owning a set of these but the costs can be staggering; in many cases, more than the value of the boat. And to their chagrin, owners discover that the competitive advantage is short-lived as these exotics quickly breakdown, delaminate and lose their shape. The Grand Prix racer cares little about this draw-back as sail inventories are frequently replaced, in some classes such as the TP52 Med Cup, every regatta. Many Sailmakers have tried to address this issue of cost by offering hybrid designs which combine basic laminate cloths with load carrying exotic fibers in what is essentially a cross cut sail. To reduce weight and cost, seams are glued rather than stitched. In extreme cases, quality construction is sacrificed to produce a cost-competitive sail. The end result is a product that while reasonably affordable upfront, still is not durable enough to stand the many years of service that the club racer expects. Lee Sails and Challenge Sailcloth have a solution. Challenge has introduced an innovative new cloth called Warp Drive in which the strength is oriented in the warp or long direction rather than the fill direction as traditional dacron cloth is woven. By eliminating the crimp in the warp oriented fibers, Challenge has produced a cloth that is light weight but with significantly lower stretch. Until this breakthrough, all dacron sails have been made using cross cut design since the strength was in the short, fill oriented cloth width. Shape was created by broad-seaming wherein the panels are cut with a curve which when stitched to the adjacent panel produces the required chord depth. Traditional Sailmakers used their skill and ingenuity to produce the optimum shape but the cross cut layout meant that bias stretch could not be fully eliminated. Warp Drive cloth allows Lee Sails to manufacture a tri-radial designed sail which produces a more detailed shape, aligning the panels to correspond to the loads, eliminating bias stretch yet using a lighter weight cloth than that used in a cross cut design. The advantage to the club racer is a quality-built sail using all the desirable characteristics of dacron such as low cost, UV resistance, easy repair and durability that has the light weight and optimum shape for competitive racing. Warp Drive, tri-radial sails from Lee Sails for the club racer cost more than traditional cross cut dacron sails but far less than the exotic load-path sails offered by the well-known major manufacturers. Warp Drive sails will give many years of dependable service.